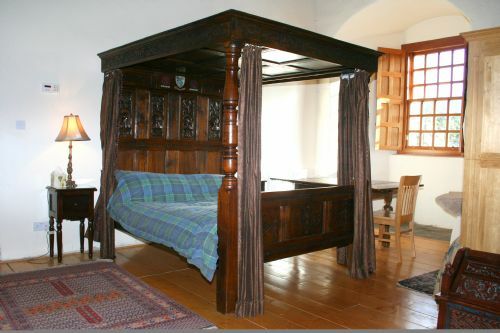 With it's Great dining Hall and superbly painted murals and designs - Dairsie offers a unique castle experience. Carefully restored from a virtual ruin as a family home between 1993 and 1996 this historic site once housed the earlier Scottish Parliament in 1335 and has been visited by royalty (James VI who escaped here in 1583). An impressive and ecclectic mix of works of art, sculptures, carvings and antique furniture help to give the interior a grand yet intimate atmosphere. The top floor spanning the entire length of the castle is a picture gallery for the enjoyment of guests. The castle has wireless broadband internet. On the ground floor there is a twin bedroom with a vaulted ceiling and ensuite bathroom. This huge master bedroom has 3 four poster beds. 1 kingsize, 2 large singles. The en-suite bathroom is complete with a stand alone bath and window shutters painted in the style of Hokusai. This room is named after one of the long term residents of the Castle, John Spottiswoode, the Archbishop of St Andrews in the 1600s. This bedroom has a double bed and an ensuite bathroom. This room is named after the family that owned Dairsie for 100 years, before they sold it to Archbishop Spottiswoode in 1616. This bedroom has a double bed and an ensuite bathroom. This double bedroom is at the opposite end of the gallery, at the top of the spiral staircase. It is carpeted and looks out over the drive. It has a shared bathroom with the South Caphouse bedroom. The Great Hall - As the hub of the castle, the Great Hall has a large dining table which can seat 12, and is surrounded by beautiful artworks and sculptures. It also has two large sofas and a footstool and around the fireplace for post-dinner relaxation. There is also a Minstrel's Gallery which overlooks the Great Hall which can be reached from a staircase behind the room, and beside which is a washroom which takes its design inspiration from the old ducat which used to stand there. In one of the corners of the Great Hall is also a small compass room which has floor tiling pointing to which way is North. The Kitchen - the kitchen has all of the usual culinary equipment and has a 2-hub aga cooker. The room has a table and chairs and is large enough also to be used as a breakfast room. Behind the kitchen is a laundry room with a washing machine and dryer, ,and adjacent to the kitchen is a washroom. The Living Room - The living room is on the second floor, situated next to the family bedroom. It is carpeted and has a tv, cd player, a cupboard and comfortable sofas. Next door to the living room is a small toy room which is filled with childrens books, toys and some board games for the evenings. The Gallery - The Gallery is a spacious area on the top floor of the castle and is where a lot of the castle's artwork and antiques are displayed. It is a very bright and large space with good views of the surrounding countryside, and is an ideal place for holding receptions. Functions can be held at the castle by prior agreement. For an outdoor event with a marquee there will be a charge of £1000 - £1500 ground hire (not including marquee). No access to indoor areas. Please hire portaloos. There is also a facility fee as follows (which is to cover insurance, cleaning costs). There is a maximum of 60 guests including those staying overnight permitted. Sorry no firework displays of any kind permitted within the grounds of the castle.